Sudan: Are Sudan's Protests Against Bashir Regime Doomed to Fail? A crowd protests the skyrocketed bread and fuel prices, among others, in El Gezira Aba in White Nile state. For weeks, the Sudanese people have been protesting against President Omar al-Bashir. Though a diplomatic pariah, his Western back channel support means he holds the cards in a standoff unlikely to deliver major change. In mid-December, the Sudanese people started to demonstrate in cities around the country. Their displeasure was directed against the government's plan to raise the prices of gasoline and bread as part of an effort to balance a weak exchange rate and high inflation. Wheat products alone would have cost people three times as much as before. The protests quickly targeted President Omar al-Bashir, who has ruled the country in an autocratic fashion for three decades. Some demonstrators set fire to buildings housing Bashir's National Congress Party (NCP), others demanded a change of government. On December 19, the situation turned violent when armed security forces intervened. Amnesty International reported at least 37 people have died in the unrest so far; the Sudanese government reported 19 people killed. Opposition leaders and organizers of the protests were arrested. Politically and economically isolated, both regionally and internationally, the Bashir regime cannot solve the current crisis, the president's opponents argued at a press conference in the Sudanese capital, Khartoum, justifying calls for his resignation. Only a new government that enjoys the trust of the Sudanese people can end the unrest, they said. 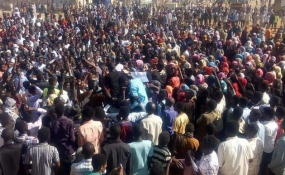 The protests continued to ramp up while Bashir remained silent -- until Tuesday, when he agreed to set up an investigative commission headed by the Sudanese justice minister. Mohamed Hassan, a Sudanese lawmaker for the opposition Popular Congress Party (PCP), believes the West's response to the protests has been disappointing thus far. "We expected more support, but we recognize that international politics is guided by its own interests," he told DW. The Sudanese government has created a regional network to implement its interests, mainly by declaring its willingness to combat illegal migration, Hassan said. "The government is trying to prevent migrants and asylum seekers from fleeing Africa," he explained, adding that it is also engaged in the fight against terrorism. Sudan under Bashir presents a gloomy picture -- the president is wanted by the International Criminal Court for genocide and war crimes, the conflicts with rebel groups in Darfur and the Nuba Mountains continue to smolder, and human rights organizations have criticized the government for limiting civil rights and civil liberties. Bashir is still in power because his rule plays to the interests of a whole host international powers, Amin Qamuriya, a Lebanese political scientist, told DW's "Massaiya" program. Many soldiers in the Saudi-led military coalition in Yemen are Sudanese, for example, he said. "Should the political situation deteriorate, the government could recall these soldiers," Amin explained, noting that Saudi Arabia has no interest in such a move. Egypt also wants to see stability in neighboring Sudan. Weapons from crisis-torn Libya find their way to Egypt via Sudan, which the government in Cairo is aming to prevent -- in cooperation with Bashir. The Egyptian government "prefers not to talk to the political parties of Sudan, but to the president," Amin said. The United States, meanwhile, has its own reasons to be patient with Bashir, said the PCP's Mohamed Hassan, adding that since the President Donald Trump decided to withdraw from Syria, Americans have been looking for mercenaries they can send there -- "and no regime sells mercenaries more cheaply than the Sudanese regime." The European Union also has a good working relationship with Bashir. He can help prevent migration from Eastern Africa to Europe and is seen as an important partner in the fight against international terrorism. Border control aims to "make it more difficult for the Darfur rebels hired out as mercenaries in Libya to retreat, as well as cutting off possible jihadist routes between the Sahel and the Horn of Africa and ultimately controlling migration flows between the Horn of Africa and the Mediterranean," according to Annette Weber, a Sudan expert at the Berlin-based German Institute for International and Security Affairs (SWP). In return for its cooperation, Sudan expects financial support from the EU. As a result, the protests in the country have yet to be met with a significant international response.